1) Jason stumbled into DJing when Sue Cummins bought a PA system and had Jason and her son Jeff DJ car cruise-ins for Lykins Oil. 2) Brandon stumbled into DJing when he bought a sound system with his tax return in 1999. 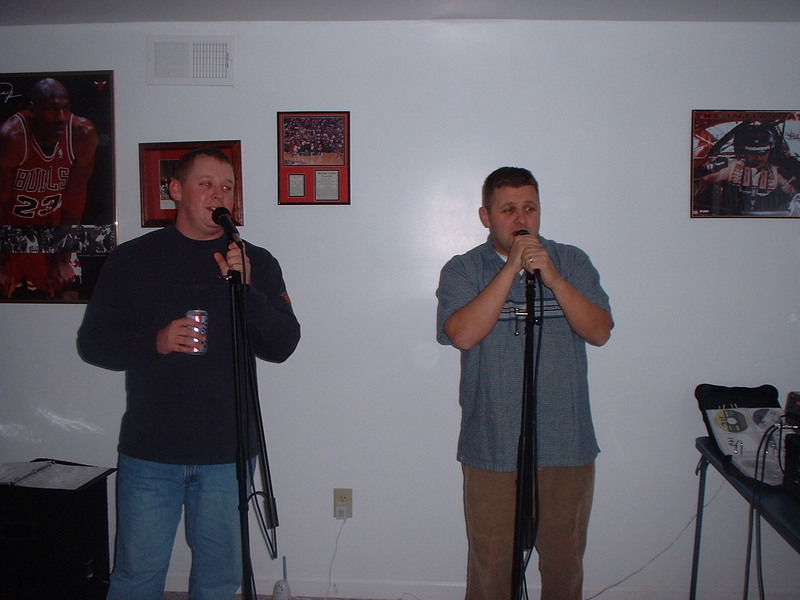 He had rented a karaoke system a few times for parties and decided to get a system to use for deck and basement parties at his house. Brandon’s system being put to use in his basement. 3) Hey! Mr. DJ Entertainment LLC was formed in Brandon’s basement just before Brandon and Jason left to go to a high school football game in 1999. Brandon wasn’t real happy with his wedding DJ a year earlier and Jason said , “I was thinking of getting into this more seriously”. 4) Brandon and Jason’s first event together was an anniversary party at the Blanchester Armory. It was Jason’s event and Brandon tagged along to see if he would like it. That night a kid locked himself in the bathroom and it took guests about 20 minutes to get him out. That entire time they asked for no music to be played. That same night a woman fell so hard in front of the DJ table while dancing, the CD player skipped. 5) Hey! Mr. DJ Entertainment’s first bar gig was at The Valley View in Williamsburg Ohio. They have since performed at many major bars around the city. 6) The name Hey! Mr. DJ Entertainment was conceived by Brandon at his desk while working as a computer programmer. It was one of 5 names he had considered. Jason immediately liked the name and it was decided. The logo was created by a graphic design student who was a friend of a lady Brandon worked with. 7) Greg Poole and Chad Ward were the first guys Hey! Mr. DJ Entertainment brought on to help with events. After Greg’s first event he got a fantastic thank you card in the mail from the bride. 8) Brandon became the wedding forum moderator at an online DJ forum sometime around 2001. Since then he has presented seminars at DJ Conferences in Tennessee, Toronto Canada and Las Vegas. He has also written articles for a DJ magazine. 9) Brandon also has traveled to Los Angeles, Las Vegas, Minnesota, Chicago, and Louisville to attend professional DJ training workshops. He also took an 8 week comedy class and performed at the Funny Bone on the Levee on a sold out night. 10) Zach Albers, who has been an MC with Hey! Mr. DJ Entertainment since 2007 has won Cincinnati Idol. He has also appeared in several TV commercials including State Farm and Speedway commercials. 11) Myron Heggood, while working with Hey! Mr. DJ Entertainment, did events with David Tueterra from My Fair Wedding. He also did events with Demi Lavato and with Cody Simpson. 12) In 2009 on the way home from performing at a wedding Brandon and Glenn Spencer witnessed a single car accident and stopped to check on the people inside. The car came to rest on top of a very high overpass bridge that was about 100 feet over the road below. The driver was drunk and climbed out the driver’s side. Glenn grabbed him and drug him across the trunk of the car and saved him from falling off the bridge 100 feet to the pavement below.